This Wednesday, the Institute on Assets and Social Policy at Brandeis University released a new study showing that the wealth gap between white and black households has nearly tripled over the past 25 years. From 1984 to 2009, the median net worth of white families rose to $265,000, while that of black families remained at just $28,500. This widening disparity is not due to individual choices, the authors discovered, but to the cumulative effect of “historical wealth advantages” as well as past and ongoing discrimination. It does not take a rocket scientist to realize that wealth generates more wealth and that centuries of unpaid labor – from chattel slavery to the chain gang – have given white families a greater reserve of inherited equity. The very same day, 3,000 miles to the east, a team of researchers at University College London launched a major new database entitled Legacies of British Slave-ownership. At its heart is an encyclopedia “containing information about every slave-owner in the British Caribbean, Mauritius or the Cape at the moment of abolition in 1833.” Not only this, the database includes information about how much individual slaveholders received as compensation for their human property and hints as to what they did with their money. The results illustrate the tremendous significance of slave-generated wealth for the British economic and political elite. The families of former Prime Minister William Gladstone and current Prime Minister David Cameron, for example, were direct beneficiaries. At the same time, the site makes it possible to trace many of the smaller-scale slaveholders scattered throughout the empire and to speculate about the impact of all that capital accumulation. Although still in its early stages, the site promises to be an outstanding resource for digital research and teaching. In part because it is so new, the level of detail in the database can be uneven. Some individuals have elaborate biographies and reams of supporting material. Others have an outline sketch or a placeholder. To help correct this, the authors welcome new information from the public. All of the biographies must have taken a tremendous amount of time and effort to compile, and all claims are meticulously documented with links to both traditional and online sources. While there are few images and maps at this stage, the site features an excellent short essay that helps to place the project and its raw data in historical context. The focus is almost entirely on metropolitan Britain, and there is good reason for this. Nearly half of the £20 million paid to former slaveholders went directly to absentee planters residing in the metropole. Still, it might be useful to place this information in wider perspective. A significant number of nineteenth-century emancipations involved some sort of compensation to erstwhile slaveholders or their agents. Throughout the Atlantic World, abolitionists occasionally raised funds to liberate individual slaves. This was how celebrity authors, such as Frederick Douglass, Harriet Jacobs, and Juan Francisco Manzano, acquired their free papers. In some cases, enslaved families were required to pay slaveholders directly. Under Connecticut’s gradual emancipation law, for example, male slaves born after a certain date were mandated to work for free until their 25th birthday (unless, of course, their enslavers attempted to smuggle them to the South beforehand). Even Haiti, which successfully abolished slavery while fighting off multiple European invasions, was extorted into a massive reparations payment to its former colonial masters, helping to generate a cycle of debt and poverty that continues to this day. The United States Civil War is somewhat unique in this regard. Although slaveholders in Washington D.C. received government compensation when the District eliminated slavery in 1862, thanks to the logic of the war, the actions of abolitionists, and above all the determination of the enslaved, rebel slaveholders received little in exchange for the loss of their human property. According to recent estimates, that property was among the most valuable investments in the nation. By 1860, the aggregate value of all slaves was in the neighborhood of $10 trillion (in 2011 dollars), or 70% of current GDP. The sudden loss of this wealth represents what is very likely the most radical and widespread seizure of private capital until the Russian Revolution of 1917. But even in this case, emancipated slaves were left to fend for themselves, their pleas for land largely unanswered. Although there have been a number of successful attempts to trace the influence of slavery within American institutions, especially universities and financial firms, the haphazard and piecemeal nature of emancipation left no comprehensive record. And this is what makes the compensation windfall included in the British Abolition Act of 1833 so fascinating. By scouring government records, researchers have been able to construct a fairly accurate picture of slavery beneficiaries and to trace their influence across a range of activities – commercial, cultural, historical, imperial, physical, and political. A cursory glance at the data reveals 222 politicians and 459 commercial firms among the recipients. A targeted search for railway investments yields over 500 individual entries totaling hundreds of thousands of pounds. According to the database, over 150 history books and pamphlets were made possible, at least in part, by slavery profits. That a sizable chunk of nineteenth-century historiography, as well as its modern heirs, owes its existence to the blood, sweat, and tears of millions of slaves is extremely consequential. And this fact alone deserves careful attention by every practicing historian. Slaveholder compensation, which equals about £16.5 billion or $25 billion in present terms, was seen as a necessary measure for social stability. The British planter class was deemed, in short, too big to fail. The funds, as Nicholas Draper explains, were provided by a government loan. And it is worth noting that this loan was paid in large part by sugar duties – protectionist tariffs that drove up the price of imported goods. Since the poorest Britons relied on the cheap calories provided by sugar, they bore a disproportionate share of the cost. Meanwhile, former slaves were coerced into an “apprenticeship” system for a limited number of years, during which they would provide additional free labor for their erstwhile owners. So the wealth generated by this event, if you’ll pardon the dry economic jargon, was concentrated and regressive, taking from the poor and the enslaved and giving to the rich. As its authors point out, the encyclopedia of British slaveholders carries interesting implications for the reparations debate. Although it does not dwell on this aspect, the site also carries significance for the ongoing historical debate about the relationship between capitalism and slavery. Recent work by Dale Tomich, Anthony Kaye, and Sven Beckert and Seth Rockman has placed nineteenth-century slavery squarely at the center of modern capitalism. 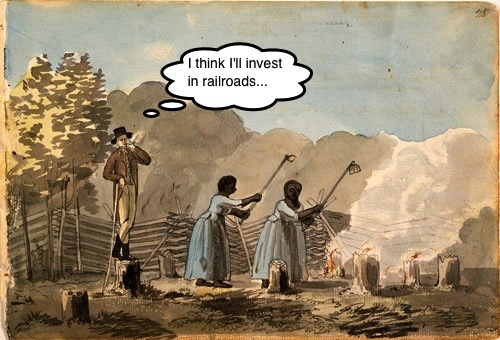 While historians may quibble about the specifics, it is clear that the profits of slavery fueled large swaths of what we now call the Industrial Revolution and helped propel Great Britain and the United States into the forefront of global economic development. The database makes it possible to glimpse the full extent of that impact, really, for the first time. Legacies of British Slave-ownership is refreshingly honest about the limitations of its data. Unlike most digital history projects of which I am aware, the authors have engaged their critics directly. One critique is that the project team is white and focused largely on the identities of white slaveholders. Yet, as the authors point out, it is difficult to relate the experience of the enslaved in a vacuum, hermetically sealed and separate from the actions and reactions of their oppressors. If I have learned anything from my study of the subject, it is that it is impossible to understand the history of slavery apart from the history of abolition, and it is impossible to understand the history of abolition apart from the history of slavery. The two are fundamentally intertwined. So what about the other side to this story? What about all the slaves and abolitionists who called for immediate, uncompensated emancipation? What about the alternative visions they called into being through their actions and their imaginations? What about the different models they offered, however flawed or fleeting, for a world without slaveholders? I served you faithfully for thirty-two years, and Mandy twenty years. At twenty-five dollars a month for me, and two dollars a week for Mandy, our earnings would amount to eleven thousand six hundred and eighty dollars. Add to this the interest for the time our wages have been kept back, and deduct what you paid for our clothing, and three doctor’s visits to me, and pulling a tooth for Mandy, and the balance will show what we are in justice entitled to. Please send the money by Adams’s Express, in care of V. Winters, Esq., Dayton, Ohio. Anderson’s descendants, in Ohio and elsewhere, are still waiting.